When the Harry Potter film franchise came to a close with the release of Harry Potter and the Deathly Hallows – Part 2 in 2011, both fans and Warner Bros. alike were in mourning over one of the best and most successful film series of all time. Given just how lucrative the series was, it was only a matter of time before it resurfaced in some form or another, and indeed in 2014—just three years after Deathly Hallows hit theaters—Warner Bros. announced its intention to expand the wizarding world with a trio of films based on the Newt Scamander Hogwarts textbook Fantastic Beasts and Where to Find Them. Not only that, but author J.K. Rowling herself would be handling the screenplay, making her scripting debut. We’re now a few months out from the release of Fantastic Beasts, which means I can finally tell you that in December of 2015, I had the pleasure of traveling to London to visit the set of the movie along with a small group of reporters, and glean some tidbits about what fans can expect from this highly promising wizarding world expansion. 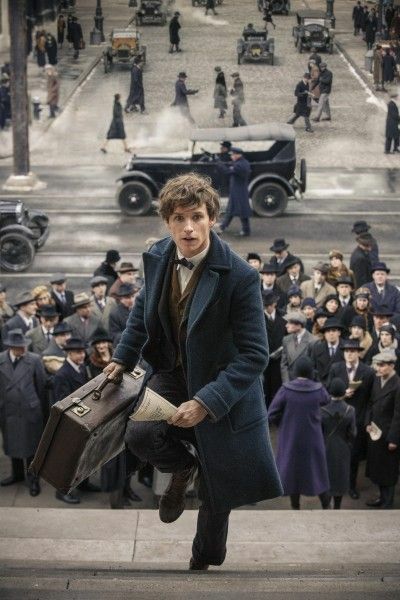 For those unaware, Fantastic Beasts and Where to Find Them takes place in the year 1926 and revolves around Newt Scamander (Eddie Redmayne), a magizoologist who is more at home with his animals than with other humans, and who finds himself waylaid in New York City when his briefcase pops open and his creatures beginning running wild. However, this is an ensemble story, and along for the ride are a former auror named Tina (Katherine Waterston), her bubbly sister Queenie (Alison Sudol), and a no-maj (American for “muggle”) named Jacob (Dan Fogler) who gets wrapped up in the world of magic and doesn’t exactly want to leave. The story of Fantastic Beasts is unique in the wizarding world for a number of reasons. Of course the period and American setting are wholly new to Potter fans, but the main difference is that this film revolves around adults in the wizarding world, not children. As such, the socio-political themes of Rowling’s script are more prevalent, as the events that transpire take place against the backdrop of an election and Newt soon discovers that the relationship between magic-folk and no-maj in America is very different from that in the U.K. Namely, there is an agreement among the heads of MACUSA—Magical Congress of the United States of America—that mingling between no-maj and magicians is forbidden, and the magic community lives in complete and utter secrecy. This leads to a sort of segregation between the communities, and as such, the fact that the titular fantastic beasts are on the loose in such a big city is a very big problem. The majority of Fantastic Beasts and Where to Find Them was shot at Leavesden Studios just outside London, where the Harry Potter films were shot. In fact, only three locations were used for the whole film, with the majority of filming taking place on the backlot. This may seem surprising, but once I laid eyes on the enormity of the sets that had been constructed, it became clear that they were building a world unto themselves on this backlot. The “main event” was a massive New York City set, which comprised basically an entire city block. The street was complete with diners, storefronts—some of which you could actually enter as full sets, as filming might require—advertisements, streetcar rails, and even manhole covers that would produce actual steam. Once we reached the end of the street I expected to see the façade, but nope, you could turn left or right and the illusion kept on going. Around the corner they had built another full city street, this one consisting of sets for Tina and Queenie’s fancy brownstone as well as Jacob’s less-than-fancy apartment. All of this was beautifully realized by production designer Stuart Craig, who worked on every single Harry Potter movie and is one of the most important pieces of the puzzle in terms of bringing the wizarding world to life—he even designed the Wizarding World of Harry Potter theme parks at Universal Studios. Just when I thought the sets couldn’t get more impressive, we were led down some stairs at the back end of the street, and wouldn’t you know it, a recreation of the Central Park Zoo has been constructed. It looked as though a major set piece was to take place here, as some of the cages were busted open, but it was a glorious recreation of a 1920s zoo complete with a seal display in the middle. This was all built outside, but on the inside of one of the stages was something even more impressive: MACUSA. This set felt more massive and more impressive than the Ministry of Magic, and indeed the walls went all the way up to the top of the soundstage ceiling. Everything was lined with tile, giving off a gorgeously elegant yet sterile vibe, with statues of famous wizards lining the walls, below each of which were desks for the various MACUSA workers. One of the finer details fans might appreciate is the fact that these desks weren’t filled with blank papers. No, actual documents with real content were littered across the desks, which is stuff the camera probably won’t even pick up. On such letter was a “Notice of Contraventions” issued by the Federal Bureau of Convert Vigilance and No-Maj Obliviation, which again is something only the actors will ever see, but serves to fully realize this wonderful world. In the center of MACUA was an enormous statue commemorating the Salem Witch Trials. Indeed, per Rowling’s own writings, the Salem Witch Trials are a major piece of wizarding history in America, and the haunting statue showed a young girl pleading with her mother, surrounded by town elders all ignoring her. It’s a moving piece of art, and one that will hopefully make its way to the screen in a prominent place when the finished film hits theaters. While on set we also had the pleasure of speaking with Redmayne, Waterston, Sudol, Fogler, Colin Farrell, Ezra Miller, director David Yates, producer David Heyman, and production designer Stuart Craig. While it was clear they were all under top secret contracts and couldn’t really reveal too much, it was nice to discuss their thoughts on the franchise as a whole, meeting Rowling, and what this new film will offer fans. I’ll be posting all of the interviews in short order, but for now you can read the couple at the links below, along with more set visit coverage. And below that, for all you obsessive fans, I’ve amassed a list of 31 things to know about the movie, from production insight to character details. 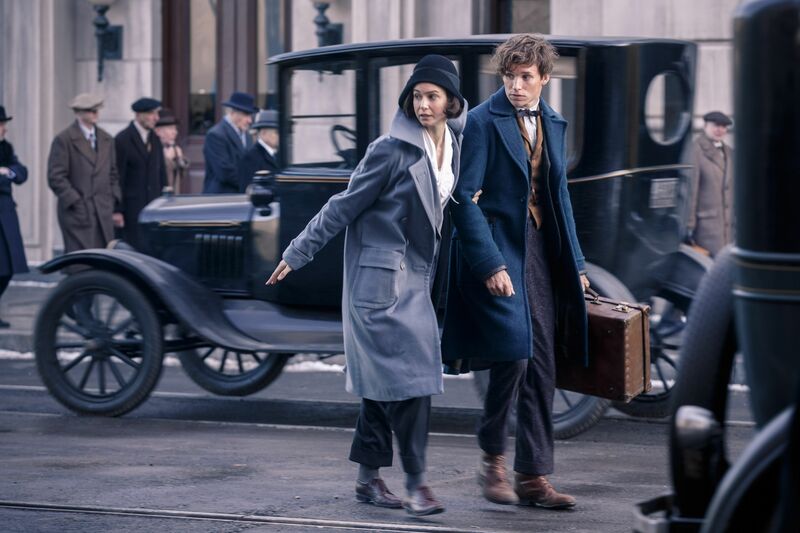 All in all, as a massive Harry Potter fan already, I came away from the set of Fantastic Beasts and Where to Find Them even more excited for this new story. Rowling’s talent as a writer is undeniable, and it really feels like she’s digging into brand new territory here while using the already established wizarding world as a backdrop to tell a fresh, and thematically rich, story. Fantastic Beasts and Where to Find Them opens in theaters on November 18th. 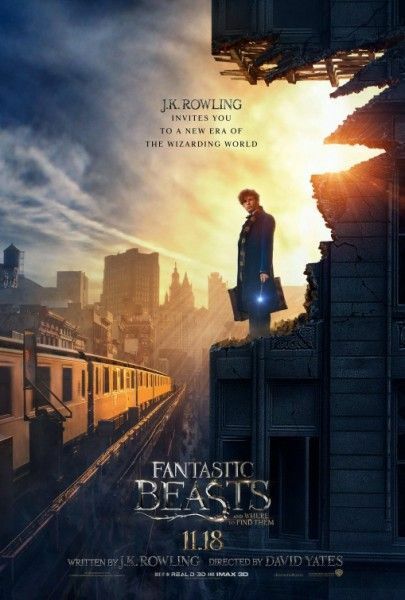 The producers were already thinking about an adaptation of Fantastic Beasts before they contacted J.K. Rowling, but their idea was to do a fake documentary about Newt Scamander. When they reached out to Rowling, she had already been thinking about the idea that became this finished film. The film is described as having a variety of colors; it’s not just darkness, humor, heart, or adventure—it’s all of these things. Fantastic Beasts, while focusing on adult characters, is not as dark as Harry Potter and the Deathly Hallows – Part 2. Eddie Redmayne was their first and only choice to play Newt Scamander. Redmayne screen tested with the copious other actors who tested for the roles of the other three protagonists of the story. Newt Scamander is an outsider who is more comfortable with his creatures than he is with people. In designing the creatures for the film, the producers wanted to ground them so they felt like things that could actually exist. K. Rowling added a few creatures that weren’t in the Fantastic Beasts book for the film, to add some variety to the visual palette. Many of the themes found in Harry Potter are also expressed in Fantastic Beasts. Themes of what it means to be an outsider, doing the right thing, the moral greyness of the world. David Yates was unsure he wanted to return to the wizarding world after spending six years on the Harry Potter films, but after reading the script he fell in love with the material. Yates was excited about the prospect of getting to build this material from the ground up, rather than jumping on the moving train that was Potter. Visually, Yates approached the film in a simply, classical, and elegant way while also embracing the 1920s aspect of the story. Yates likes to keep the camera rolling between takes so the actors can roll right into another take without breaking for 10 minutes to think about the scene or lose concentration. Eddie Redmayne got to help pick which wand would be appropriate for Newt. The story of the film takes place over the course of a couple of days. Redmayne got to meet with Rowling before the start of filming, where he proceeded to grill her for information about Newt. When Newt first appears in New York, he’s been in the field for a year. They used a variety of techniques for the various creatures opposite Eddie Redmayne, as it was important that they were each treated like different characters. Pickett, who is a little stick creature, was a little stick with a wire that was controlled by a puppeteer for rehearsals, then when they shot there was nothing there but Redmayne knew what it would feel like to have the character on his shoulder. When Ezra Miller, an avowed Harry Potter fan, found out he got the role, he dropped to his knees in the middle of New York and started yelling. MACUSA, the American version of the Ministry of Magic, has a female president named Seraphina Picquery, and the wizarding community as a whole in the 20s doesn’t seem to be divided as much by race or gender as the muggle community is. Colin Farrell plays Graves, the chief security officer for the protection of wizards for MACUSA. He is the right hand man of President Picquery. Graves is investigating the goings-on in NYC, and he corresponds with Newt’s brother Theseus who lives in the U.K. and is a very powerful Auror. The film utilized 11,000 extras in all to bring the world and the bustling streets of 1920s New York City to life. MACUSA operates with the technology of the time period, like vacuum tube mail delivery systems, but in a magical way. The majority of the film was shot at Leavesden Studios outside London. There were only three on-location shoots, all in Liverpool. Newt’s wand is made of bone and appears more handmade. They built a massive New York City exterior set at Leavesden which included real shop fronts, stores that you could go inside, streetcar rails, and even manholes that produced steam. Jacob lives on the Lower East Side of New York. Tina and Queenie live in a brownstone. Jacob has just returned from World War I, so he’s a bit desensitized to the beasts that are flying around. Fogler sees the Jacob/Newt relationship as the origin story of Holmes and Watson. Jacob comes into the story when he gets bitten by one of Newt’s magical creatures. Jacob becomes very friendly with a creature called the Demiguise, which is hard to catch because it can tell the future. Jacob has a crush on Queenie. Sisters Tina and Queenie basically raised each other because their parents died when they were very young. Goblins and elves appear in the film. Some of the Fantastic Beasts featured in the movie include the Nundu, Thestral, Doxy, Mooncalf, Billywig, Kappa, Fwooper, Diricawl, Hippocampus, Giant Dung Beetle, Graphorn, Lethifold, Runespoor, Murtlap, Erumpent, Pickett, Demiguise, and the Niffler. There was snow on the streets of the New York set, with newspapers noting the date as December, so the film takes place during the winter. There’s a jazz club in the film called The Blind Pig. Production Designer Stuart Craig once again made the magical world synonymous with Gothic architecture, but the New York setting feels more contemporary than the Harry Potter films even though those took place in contemporary times. MACUSA headquarters was in part based on the Woolworth Building in New York, per J.K. Rowling. The film features a reproduction of the City Hall subway station. There’s a giant clock in MACUSA that measures the threat level that the magical world is feeling at any given moment. At their most busy, the production was up to 350 construction workers and craftsmen in order to bring the sets to life.